The Texas Republican Party is taking very seriously the possibility of Hillary Clinton running for president in 2016 — and the idea that the red state juggernaut could actually become a battleground.In an interview with Real Clear Politics, state GOP Chairman Steve Munisteri said they’re not dismissing the idea that Texas could go blue come next election. Texas Democrats are even more optimistic. Tanene Allison, the state party communications director, said Texas could “absolutely” be a swing state, just four years after former Massachusetts Gov. Mitt Romney beat President Barack Obama by nearly 16 whole points. 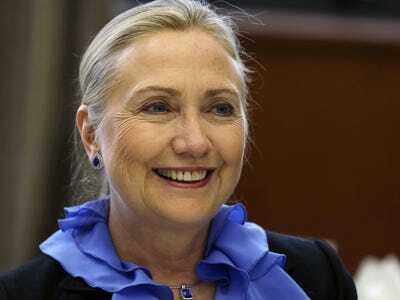 Such confidence is bolstered by a survey last month by the Democratic-leaning Public Policy Polling that showed Clinton coming out on top in hypothetical 2016 match-ups against Florida Sen. Marco Rubio, New Jersey Gov. Chris Christie and Texas’ own governor, Rick Perry. San Antonio Mayor Julian Castro, who delivered the keynote address at the Democratic National Convention in September, was similarly optimistic about his state’s future first as a “purple” and then as a blue state in an interview with CBS News’ “Face the Nation” last month. “In a couple of presidential cycles, you’ll be on election night, you’ll be announcing we’re calling the 38 electoral votes of Texas for the Democratic nominee for president,” Castro said.